Govind P. Agrawal received the MS and PhD degrees from the Indian Institute of Technology, New Delhi, in 1971 and 1974 respectively. After holding positions at the École Polytechnique, Paris; City University of New York, New York; and AT&T Bell Laboratories, Murray Hill, NJ, he joined the University of Rochester in January 1989, where he is currently the James C. Wyant Professor of Optics. Dr. Agrawal is a Life fellow of IEEE and a Fellow of the Optical Society of America (OSA). He has served on the editorial boards of many journals devoted to optics and was the Editor-in-Chief of the OSA journal Advances in Optics and Photonics from January 2014 to December 2019. He chaired the OSA Publication Council in 2009 and 2010 and was also on the OSA Board of Directors during that period. 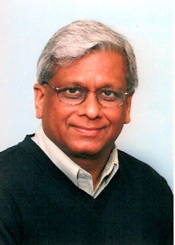 Professor Agrawal received the IEEE Photonics Society’s prestigious Quantum Electronics Award in 2012. He was the recipient of 2013 William H. Riker University Award for Graduate Teaching. Dr. Agrawal was awarded the Esther Hoffman Beller Medal of the Optical Society in 2015. Dr. Agrawal's research interests cover several areas of optics including nonlinear photonics, fiber optics, lasers, quantum optics, silicon photonics, and optical communications. He has authored eight books several of which are used worldwide for teaching and graduate education. His book on Fiber-Optic Communication Systems (Wiley, 4th ed. 2010) is a standard graduate textbook in many universities worldwide for training telecommunication engineers. His book on Nonlinear Fiber Optics (Academic, 5th ed. 2013) has helped in training a whole generation of scientists and appears among the 10 top cited books in Physics at Google Scholar and has helped in training a whole generation of scientists. He has published more than 450 research papers in the internationally reputed scientific journals.